It is a light frame made of a Titanium 3al - 2.5v alloy. The titanium is welded into a special room of the Tommasini factory, that Irio reserved and technically prepared for this purpose. The titanium production, in fact, has to be done into an aseptic environment, separated from the rest of the laboratory. This room needs to be darkened and filled with inert gas to avoid any kind of tubing contamination. The full titanium rear triangle, made of the same alloy of the frame, confers to the frame the maximum flexibility in response to the vertical road shocks, orienteering, in this way, the frame to riders that makes comfort the principal prerogative of their bikes. 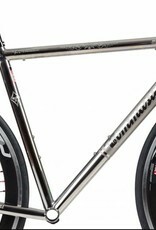 The seat tube can be requested integrated for a more modern version of the frame. 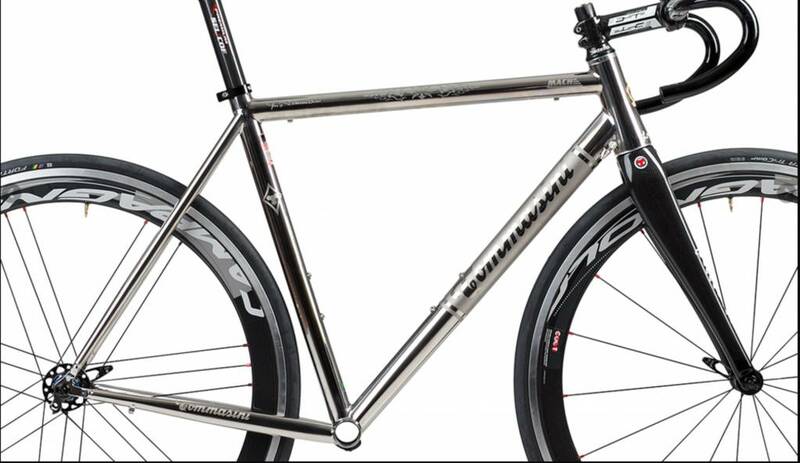 Also the rear dropouts are in titanium, pantograph to personalize the frame in harmony with the Tommasini style. The head tube is for integrated system head set, and it is customized according to size necessary to the rider. MACH is available natural or painted according to customer demand.